Folding Sunglasses - CTS Wholesale LLC. 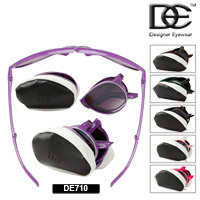 DE™ Designer Eyewear brings to you Folding Sunglasses! These are a hot new seller, in awesome Aviator styles; with excellent frame colors. But best of all, each pair in every dozen comes with an individual carrying case; in black & white with a zipper closure. Ok, maybe that's not 'best of all' but it's still pretty cool! Cooler yet however is the manner in which these fashion sunglasses fold up to take up less than half the space of a normal pair of sunglasses. To describe; each arm folds inward upon a sturdy hinge, and then following an average pair of shades, they fold at the temple hinge. Finally they fold at the bridge of the nose. The final folded pair will fit comfortably in the palm of the hand, or in the provided case. DE706: This stylized aviator frame, sometimes called "Stunners" Has a somewhat less tear-drop shaped lens that is A-typical aviator. Each pair has an attractive frame color, with a stripe of complimentary color. Lens tints in this collection are a gradient tint. On Sale Now! 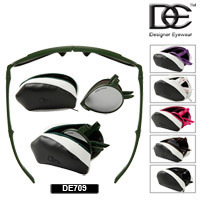 DE709: Possibly the most tear drop shaped lens from the entire selection of folding sunglasses, this model comes with a highly mirrored lens with dark green lens in addition to other popular frame colors including hot pink, purple, white, black and tortoise. Several of these frame colors have an accenting color across the bridge. On Sale Now! DE710: Last but not least, this model comes with many of the above mentioned colors, with accenting trim in complimentary colors. The lenses are very rounded, and offer full coverage of the eye area. On Sale Now!